I wore my navy blue shirt again when BOSSY rolled through town on her excellent road trip. The navy blue shirt made yet another appearance when I made my first local television appearance about the blogging I do that caused me to buy the navy blue shirt in the first place. I have an official lucky blogging shirt. Would anybody judge me if I wore it all four days in San Fransisco? P.S. You probably won’t be seeing any video of me on TV, I don’t have that fancy Tivo, I have no idea how to get it off my DVR and I’m not really even on the screen a whole lot, they showed a lot of clips of the stuff I was talking about. Besides, I said “ERM” instead of “UM”. I don’t need that circling the internet and reminding me, oh, ERM, everyday of my slip on live TV. 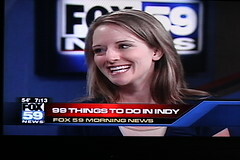 My husband works for Fox 59. I’ve traded lipstick secrets with Angela Ganote. And she has some of the cutest kids around. Now you are famous! And I can say I know you! Erm is a VERY English thing to say so just think of it as the cosmopolitan well traveled cousin of um. Mullins! Soooo is it a made up name? If it is where didja get the name?? I’ve been checking a bajillion times a day and now I don’t get video?!?!?! 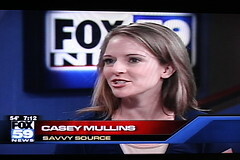 You look great- congrats Casey Mullins. That is such a nice top, so no, no judgement here. Oh – love the top. Wear it! Hey Michelle – do Casey a solid and bribe that husband of yours for a copy of the segment. You know, for posterity’s sake. Aw, I missed it! 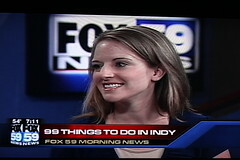 I tried to find the video on Fox 59′s website – but its not on there – jeez. Congrats on your cool tv shoot! I didn’t know you were famous!! I have a black shirt that I wear to all important functions. I wouldn’t say it’s lucky, but it does hide my muffin top quite nicely. Casey! That is so exciting! I NEED TO SEE THE VIDEO. I have to say I also own no navy or polka dots. I always think they are both grandma-ish. However, that shirt of yours is lovely- and if you get lucky in it (whatever you define as lucky) – wear it ALL the time! No judgement! With kids I am lucky to find a clean shirt on some days. Wear it! It’s not socks or underwear, and really that’s all that NEEDS changing regularly. Okay, I’m officially delurking. Found your site about a week ago and after a week of avoiding work I’m finally all caught up! Too creepy? Yeah, sorry about that. I just wanted to say that I love reading your blog and, as a native Hoosier, I’ve now been racking wondering if I’ve seen you and the moosh around town. Again with the creepy, I know, I’ll try and keep that to a minimum, promise. Wow, I totally need a lucky blogging shirt. Maybe it will help me met Redneck Mommy. LOVE HER! Uh but of course I have to go to Blogher…or Canada…or something like that . But wait is that lucky shirt lucky enough to produce magic money for BlogHer. No ? Damn! alis last blog post..i’m a television whore. and i need your help. 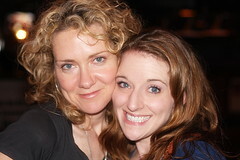 Barb @ getupandplays last blog post..Pay It Forward!!! You look like hot stuff on a stick. With cherries on top. I once had a lucky top. Course it eventually became too small for me to wear, therefore in highschool it became my VERY lucky top! Caseys last blog post..break over. You look fab in that navy shirt. I remember it! And no, I won’t judge you if you won’t judge me for getting sloppy drunk. (-; If I offer to buy you a drink more than twice, you have permission to slap me sober. The area of Indy that I grew up in, that shirt would have had you pegged as either a communist or a devil worshipper! Not a flower or denim patch in site…WOW….you totally ordered that off the internet, didn’t you? And I have to agree, you do look fab on TV. Man, Bossy is gorgeous, isn’t she? You’re one hot potato yourself of course. I just have never realized how striking her face is. Oh, and I like the shirt. But I am not buying all new clothes for BlogHer. Me no like shop. But you looked hot, so who gives a damn what came out of your mouth. Dude, I totally sounded like a piggish guy just then, didn’t I? I don’t think I’ve seen a picture of you before, you’re cute! I love the blue shirt. It is definitely your lucky shirt and you have to take it with you!! You look good on screen! You should totally become a TV personality! What the hell?! You were on TV? I want to see your interview! Why were you on? What did they ask? Did you already cover this information in a previous blog and I am now exposing myself as a sporadic reader? Yikes. I don’t have a lucky blogging shirt. I have lucky underwear. They’re invisible and I wear them all the time. FPs last blog post..Do they have these tunes in their machines? Because I’m ready. it’s a super stinkin cute shirt for a super stinkin cute mama! biddys last blog post..A New Record! 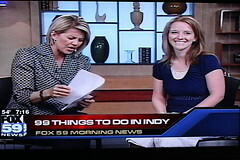 I had no idea you were on the news… and that is such a cute shirt, you should wear it everyday, not just at blogher! An official blogging shirt? You’re on live TV? I’m not worthy to read your blog. Seriously. Way out of my league. But I can’t stop now ’cause I’m addicted to this blog. you looked great on the tube….I watched it live on my sofa, drinking my coffee…just to see you. it was fab. DesignHER Mommas last blog post..Happy Birthday Birdie! Wow, you were on TV! squeee! You look gorgeous!